Hey there, are you serving Chef Alyssa Starr's Fiery Jerk Turkey Chili still? We had it on special in mid-April. People loved it so much we're looking on having it back regularly once the weather gets chilly again this fall or winter. We'll keep you posted. We’re giving away the first case of ICKY bottled from our new high-speed bottling line! 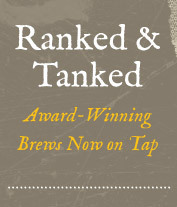 Every pint you enjoy from now until May 4th at Taps & Tanks gets you one entry into the raffle. Our tasty jalapeno-infused brew pairs perfectly with any of our many Mexican-inspired dishes. Enjoy our Fresh Brewery-Made Salsa, Loaded Nachos, Steak or Grilled Mushroom Quesadillas, Sonoran-Style Fish Tacos, Salmon Tacos with Fresh Mango Salsa, Sweet & Zesty Carnitas Tacos, or our vegetarian La Flaca Rice Bowl. MOM GETS A COMPLIMENTARY PINT OF BEER, GREAT BASIN FLOATINI OR GLASS OF HOUSE WINE WITH THE PURCHASE OF ANY ENTRÉE. Crisp Greens with strawberries, almonds, grilled chicken and a Bitchin’ Berry Vinaigrette, served with ICKY bread. We're doing our part to bring attention to the craft beer movement throughout the U.S with 10% off Great Basin swag plus pairing our daily food specials with our beers on tap. Calling all grads, parents, family and friends...come celebrate with Great Basin! Order your kegs now for your graduation parties, and don't forget, we've got gift cards, growlers, six-packs and plenty of fun apparel and keepsakes to remind them of those great ol' college years. Or come on into to either of our brewpub locations for your celebratory dinner with the family after the ceremony. We've just added some fresh new dinner items and new seasonal brews to our menu, patio seating is open, the sun is shining and the future is looking bright! A brew so exotic, you didn’t even know it existed. Soak it in. Drink it up. We will be having another Feast Among The Yeast June 5th at 6 PM. A very special group of people will enjoy a meal paired with libations in the midst of the brewery with a brewer on hand. This feast is even more special only because we are having a mixed group of 12 people. The cost for the Feast is $28 plus tax and gratuity. Couples or singles are encouraged to call our Reno location (775-284-7711) and reserve their spot. Bring a friend or make new ones!